The honest-to-goodness hole in the wall, with its duct-taped booths and old-school Texas manners, is a perfect place for a new romance. “My name’s Jackie T!” a grandfatherly man at the bar called out, with Abbott and Costello timing. Laughter, actual merry laughter, ensued. 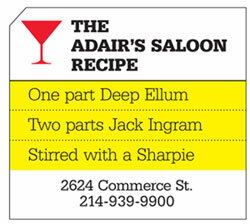 Adair’s has been around since before I tried to sneak out of the house in high school to go to Deep Ellum, and it will likely be around when current kindergarteners are learning to open bedroom windows quietly. It’s a dive, a joint, an honest-to-goodness hole in the wall with duct-taped booths and a small stage for bands and singer-songwriters (Jack Ingram recorded a live album here). A photograph of young Elvis, his sweet smile not yet corrupted by the wear of fame, graces one end of the bar. A shuffleboard table lines a wall. You can try to read the graffiti that covers every surface (including the ceiling), but the light is bad. There’s no printed menu. Just order a burger or cheeseburger. They’re a half-pound big and come with a jalepeño on top, in case you like a little pain with your lunch. It’s the kind of place where old-school Texas manners—such a lovely thing—emerge, where the guy next to you will say hello as he sits, make eye contact, and ask how you’re doing, before leaving you to your lunch. Sitting-at-the-bar conversation seems to be guided by the same principles as two-stepping: courteous, pleasant interludes that don’t monopolize your evening. In short, it’s a place that Willie Nelson might love or that Molly Ivins, God rest her soul, might have gotten drunk in. But it just as comfortably accommodated my old friend Jed Morse, the Nasher Sculpture Center’s curator. Jed happily joined me and another friend at Adair’s for a draft Shiner served in a plastic stein. People planning longer nights or who have more friends can avail themselves of buckets o’ beer. They serve cans of Pearl Light. People often speak of “instant classics.” That oxymoron is troubling. A classic, a real classic, is something with a little history to it, something with idiosyncrasies and a style that have worn well through multiple people, multiple generations. Part of Adair’s appeal is its worn-ness. The graffiti comprising zillions of lines penned by heaven knows how many people is a literal manifestation of an extended conversation. The building itself houses a thousand people’s thoughts and wishes and witticisms. The graffiti is a visible imprint of so many of the people who’ve been through, just as the depression in a stone step shows the countless feet that have passed by. Classic is about more than being good; it’s also about endurance, survival. The matchmaker lady sitting at the bar never did find a man whose name started with “T” (granted there were only about 10 of us eating lunch that day). But then a thought struck her. After “T” comes “U.” Where, oh where, she wondered in her raspy voice, was she ever going to find a Ulysses?